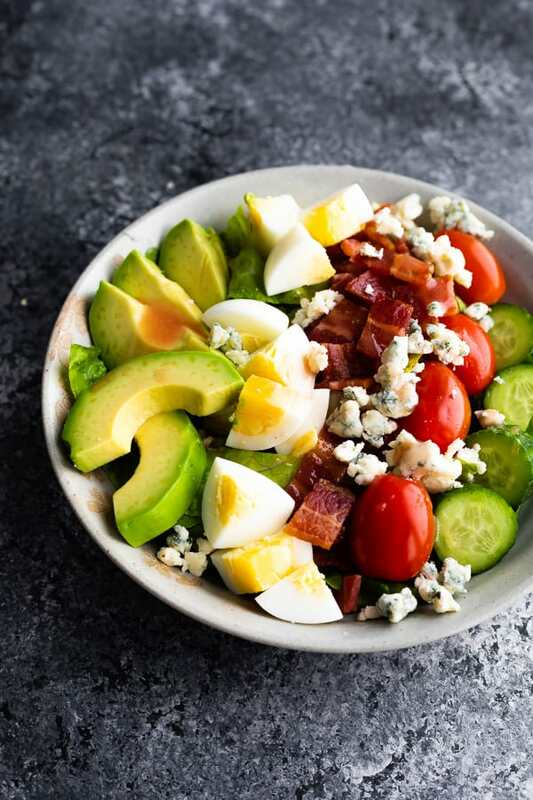 Cobb salad is a hearty, healthy lunch that is packed with protein! With bacon, hard boiled eggs, blue cheese and avocados. I *think* I may be finally coming around to hard boiled eggs, guys. If they are served with bacon, avocado, blue cheese and a red wine vinaigrette, you can absolutely count me in! 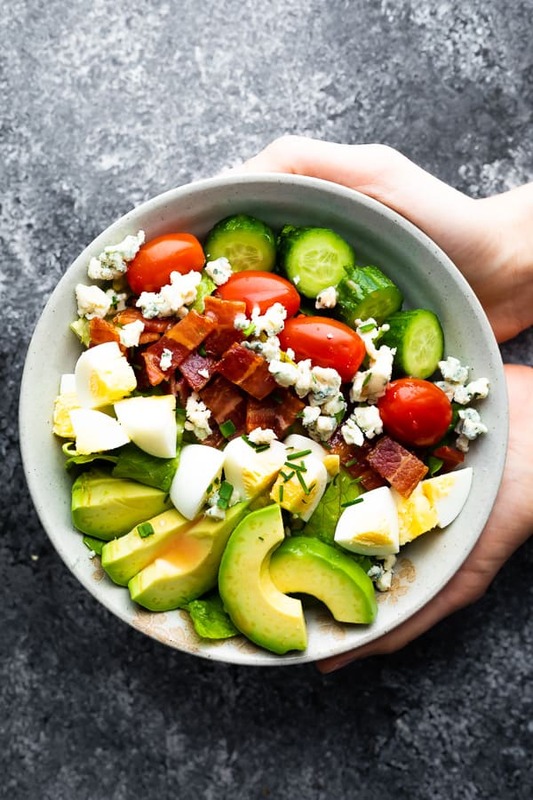 Sharing this cobb salad recipe with you today because it has been one of my favorite lunch recipes lately! Not only is it packed with protein, veggies and healthy fats, but it tastes a-freaking-mazing. 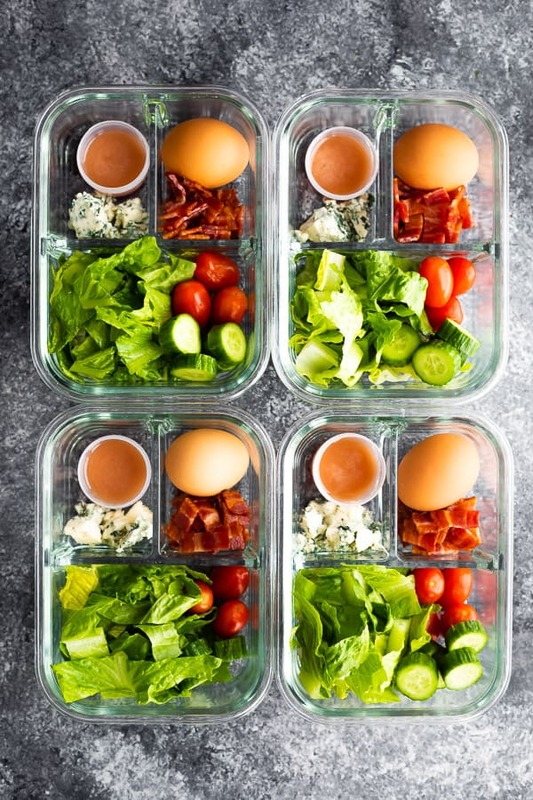 Cobb salad can be kind of tricky when it comes to meal prep, so I’m sharing my tips to keep everything nice and fresh for up to 4 days. it tastes amazing. Seriously. Amazing. 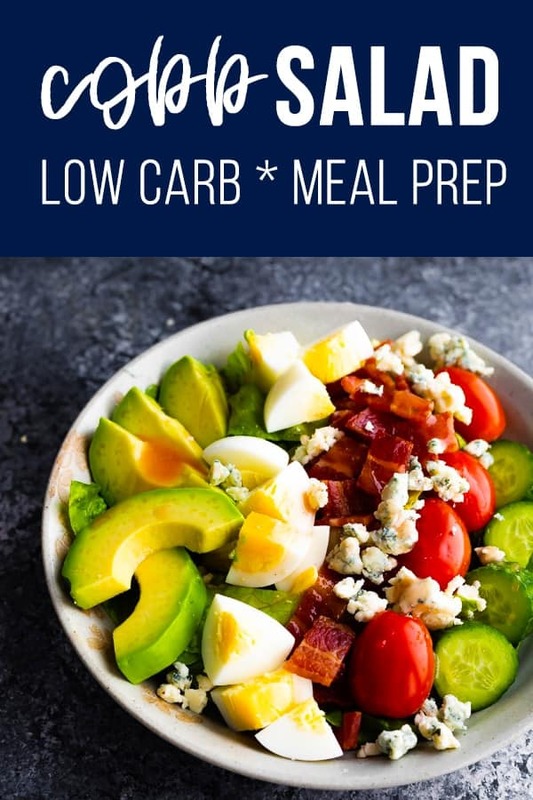 There are a few different components to cobb salad, so it does take a little longer to prep than some of my other meal prep recipes, however I promise you: it’s SO worth it! 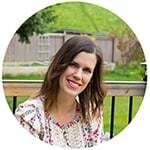 Cook your bacon– I used sugar & nitrate free bacon from TruLocal, which is an amazing company that supplies Canadians with locally sourced quality meat. If you want to save $25 off your first TruLocal order, use the code DENISE7297. I baked my bacon in the oven! Cook your hard boiled eggs- I used Kelly’s Instant Pot Hard Boiled Eggs recipe! Shake up your dressing– I used this red wine vinaigrette, but you could also use a white wine vinaigrette. It was also AMAZING with my homemade caesar dressing. Drool! Chop your veggies– romaine, tomatoes (leave whole) and cucumbers (sliced into rounds). Add whatever you’d like! Crumble up some blue cheese– don’t like blue cheese? swap for feta or cubed cheddar. and they worked great for this recipe! leave the hard boiled egg intact until just before serving. I left the shell on because I find they get a little slimy if you peel them ahead. 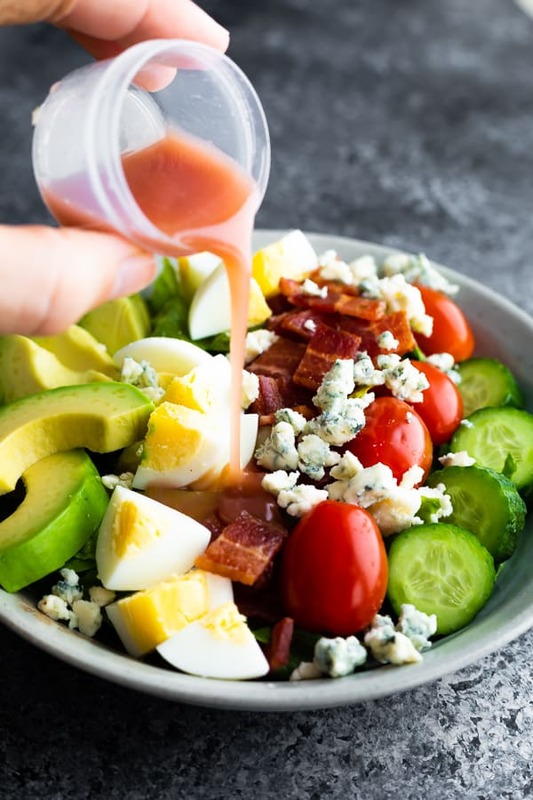 Which is the best Cobb salad dressing? Traditionally a red wine vinaigrette is used, however we have enjoyed this with a white wine vinaigrette and caesar dressing. I bet ranch dressing would be great, too! Can I add chicken to Cobb salad? Traditionally, chicken is added! You could certainly add in some cooked, cooled & shredded chicken if you’d like. Why is it called Cobb salad? You can read the whole story here! I used sugar & nitrate free bacon from TruLocal, which is an amazing company that supplies Canadians with locally sourced quality meat. If you want to save $25 off your first TruLocal order, use the code DENISE7297. I baked my bacon in the oven! Cook bacon in a frying pan or in the oven . Set aside to cool and cut into small pieces. Cook eggs in an Instant Pot or on the stove. Allow to cool. Peel & cut into cubes. Prepare red wine vinaigrette and toss all veggies in the dressing. Divide veggies between four bowls. 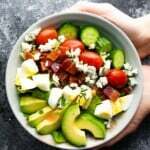 Top with the bacon, hard boiled egg, blue cheese, avocado and chives if desired. Using a multi-compartment container, keep the veggies separate from the dressing (I would use a condiment container for the dressing). I like to keep my eggs peeled but you can peel them ahead. Toss all ingredients together just before serving and enjoy! This salad was a hit with everyone in the house! perfect. So happy to hear this! Thanks so much for taking the time out of your day to leave a review, Kelly! Amazing! You should do more keto friendly recipe please! Thanks for the suggestion! I try to do 1-2 per month!